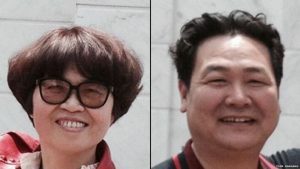 In February 2016, a court in Xinhua in China’s Zhejiang province found senior pastor Bao Guohua and his wife Xing Wenxiang guilty of corruption and sentenced them to 14 and twelve years respectively in prison. They had protested against the Chinese Communist Party’s cross removal policy in Zhejiang province and had refused to remove the cross from the roof of their church, Holy Love Christian Church in Jinhua. Bao Guohua was a government-approved pastor in the Three-Self Patriotic Movement (TSPM) and a member of the China Christian Council (CCC). The TSPM and the CCC are China’s two officially-approved Protestant organisations. He and Xing Wenxiang, also a pastor in Holy Love Christian Church, were detained in July 2015 after they publicly criticised the cross removal policy. They were found guilty of four charges: embezzlement; gathering a crowd to disturb public order; illegal business operations; and concealing accounting documents, accounting books or financial statements. The Zhejiang Daily newspaper reported that as well as their prison sentences, Bao Guohua was sentenced to confiscation of assets totalling 600,000 Yuan (€82,800) and fined 100,000 Yuan (€13,800), and Xing Wenxiang was sentenced to confiscation of assets totalling 600,000 Yuan and fined 90,000 Yuan (€12,400). The sentences are among the harshest imposed on clergy in China in recent years. Wucheng District People’s Court of Jinhua also found Guohua and Wenxiang’s son Bao Chenxing, a church deacon, guilty of corruption, and sentenced him to three years in prison. Chenxing was taken into custody with another Christian, Wang Zhaojun, on the same day as his parents. The authorities intercepted them on the stairwell of Chenxing’s apartment complex as they returned home from an early morning church service. They were forced from the 11th floor into the basement, where officials handcuffed them and covered their heads. The authorities took Chenxing to Shuanglong Police Station and Zhaojun to Bailongqiao Police Station, where he was interrogated to the point that he had to be taken to hospital. He was released the next day. 26 July 2015 The three family members were detained after they publicly criticised the Chinese Communist Party’s policy of demolishing crosses on churches across Zhejiang province. They were charged with embezzlement shortly afterwards, and later the authorities forced them to dismiss their lawyers. 20 October 2015 Wenxiang wrote two letters from prison to family and friends begging them to hire legal aid. In one of them, to her brother, she asked him to take care of their mother. 25 February 2016 Wucheng District People’s Court of Jinhua found Guohua, Wenxiang and Chenxing guilty of corruption, and sentenced them to 14, twelve and three years respectively. Nine other church staff received sentences of varying lengths.